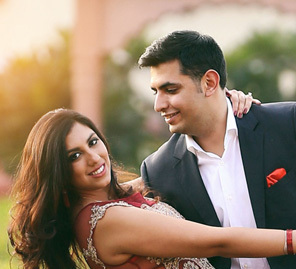 Nikhita and Mamik’s gorgeous wedding is proof that opposites attract! And make magic! It was with much apprehension that Nikhita and Mamik finally agreed to their parents’ constant requests to meet each other. And as they say, “Mom (and Dad) knows best!” because even though that meeting didn’t go as planned, they were comfortable enough to plan casual dates from where a story straight out of a romantic novel grew. 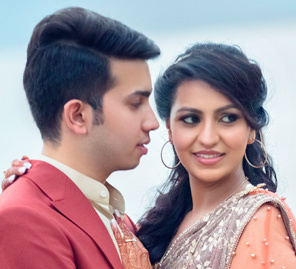 It wasn’t long before the two lovebirds were planning a beach wedding to celebrate their love and have it captured in breathtaking images by Flgroe Studios at the Grand Hyatt, Goa. Our first meeting was a disaster! Our parents had coaxed us to meet each other while we had already set our minds on rejecting each other. But it was a little later that we opened up to each other and something changed. In no time, we knew that we belonged together and enjoyed a great friendship before becoming lovers! We wanted each and every guest to not just enjoy the wedding but also celebrate with us and feel comfortable. So we organized a cricket match – family vs family. We called it the ‘NM Shield’ and the teams had weird names like Multiple Scoregasms, Kiss My Vaas and Bangers. It was exactly as fun as we imagined it would be and got the families together. There were some great performances by our friends and family that made the event extra special. The décor was dreamy in shades of purple, with an illuminated entrance, chandeliers and floating candles. I wore a heavily embroidered, off-shoulder deep purple lehenga to complement Mamik’s black bandh gala. What’s a wedding without a sundowner? We organized a Goan Carnival-style party outdoors in the garden overlooking the ocean. 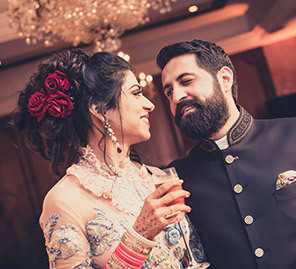 Our family and friends entertained our guests with special dance performances, had unlimited cocktails and also participated in games that kept everyone engrossed throughout the evening. After sundown, we had a surprise! A rain dance! Then the celebrations continued indoors as the family let their hair down to the latest Bollywood tunes and snacking on finger foods. We’d always wanted our wedding to be unique, to stand out in the memories of our guests as a day of joy! On the morning of our big day, we arranged for a nautical themed ‘spa party’ as a prelude to the wedding. The party was held in the garden with a blue and white color theme. Guests were treated to cocktails, soothing foot massages and games. This was followed by the baraat ceremony in the afternoon, which then seamlessly eased into the pheras. I wore a traditional red lehenga with heavy embroidery and kundan jewellery in honor of the grandeur of the day. The reception was our after-party. We had a black tie dress code and from impromptu dances to emotional speeches, it was a beautiful reminder of the events that had led up to our holy union.